The release of Apple's next revision of Mac OSX, version 10.7 – called "Lion" – brings a number of big and small changes, from the direction of scrolling to the colour of buttons to ad-hoc Wi-Fi sharing. Here to guide you through them and tell you what's good, what's less so, and what to avoid, is Matt Gemmell. When Apple held its "Back to the Mac" event in October 2010, many OS X users breathed a sigh of relief. There had been a perception that Apple's focus had been solely on iOS, the operating system for the iPhone and iPad, for quite some time – accurate enough, and understandable given the meteoric rise in the number of people using an iOS device in recent years. The announcement of Mac OS X "Lion" (version 10.7) served as reassurance that Apple hadn't forgotten about its existing customers. But there was another meaning to "Back to the Mac": it indicated that many of the new features in Lion had been inspired by iOS, or born of lessons learned during the development of iOS. The good parts of iOS had been fed back into OS X. Which makes sense, since millions more people have used iOS devices than Mac OS X ones; but the Mac OS X market is gaining new users every quarter (Mac sales have been growing faster than the PC market for five years). With the previous release of OS X, Snow Leopard (reviewed here) being seen as more of an overall improvement and refinement (with plenty of new developer APIs) rather than adding lots of new visible features, OS X was due to give some more love to the average user. Thankfully, Lion delivers. As soon as you reach the login screen, it becomes plain that Lion serves up a raft of cosmetic tweaks, as every OS X release does; this time, making nods towards iOS. Most are subtle, but the new appearance for choosing a user account to log into doesn't fall into that category. The textured background behind many iOS interfaces when you scroll past a boundary is shown in its full and somewhat sombre glory. 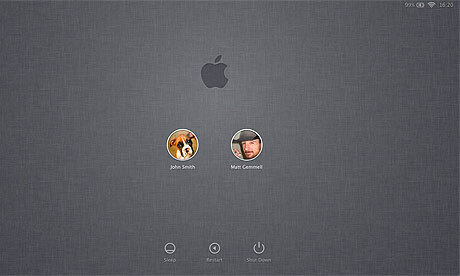 User account photos are now rendered in bubbles, not just here but throughout the OS, including in the Fast User Switching menu and in AirDrop. There's something kiosk-like about the new visual cues; it feels just a little bit less like a computer and more like an appliance. When you reach the desktop, you'll find not much has obviously changed – until you're presented with a large window informing you that the default scrolling behaviour has changed: by default, Lion now moves content in the direction your fingers move on the trackpad or Magic Mouse, such that you move your fingers upwards to move web pages upwards (thus "scrolling down", as we'd call it). In other words, it's just like iOS. You can change back to the old behaviour if you wish. It takes some mental adjustment, but after a few days it does make more sense, particularly when paired with the other multi-touch gestures which permeate the new OS. This is the scrolling direction to bet on from now on, and it's not by accident that Apple enables it by default, and calls it "Natural". As far back as 2003, Steve Jobs was grumbling about interfaces where it's up to you to keep the files neatly ordered – where "you're the janitor". 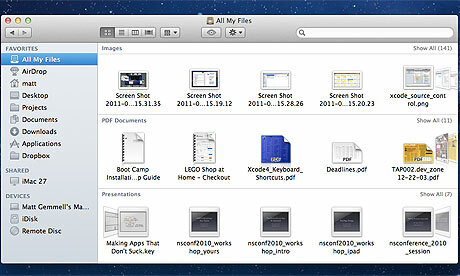 Despite Apple's apparent dislike of users having to explicitly manage a file system (to which Spotlight and Smart Folders on OS X are testament, along with several new Lion features; iOS doesn't even give the user access to the file system in any direct way), a new release of OS X always includes a host of tweaks to the Finder's appearance and behaviour. Lion is no exception. The Sidebar in Finder windows has undergone an iTunes-like cosmetic transformation: its various icons now all shown in grey. As with iTunes, it's a questionable decision, making specific folders more difficult to find at a glance. On the plus side, we have a new view of documents entitled All My Files. It's a series of CoverFlow-like browsers, sorted by file type, of all your own documents regardless of location, and definitely useful when, say, you want to find a certain presentation, say, but don't recall the name. Spotlight can provide that functionality too, but a visual browser is more consumer-friendly than a search field. Once again, it's yet another alternative way to find and access your files. Searching for files is also improved with the new Search Tokens (also available in Mail), which are a middle ground between an unadorned Spotlight search (type some text into the search field) and a Smart Folder (a saved, continuous search). As you type a query into a Finder window's search field, Lion suggests the actual search criteria you want: you type "Guardian" and it suggests what you're after is "Filename contains 'Guardian'". If you confirm these criteria they're inserted into the search field as blue tokens, which you can interact with to broaden or narrow their scope. It's a remarkably intuitive way to make very precise searches without having to know the arcana of Spotlight's more complex query syntax (which remains available to those in the know, of course). As soon as you look at the Dock in Lion, you'll notice a new icon for one of the tentpole features of the new OS: Launchpad (also available via a gesture, as you'd expect: swipe upwards on a trackpad with three fingers). Launchpad is the iOS Home screen interface, but on your Mac: rows of icons, freely re-orderable and which can be grouped into folders, spanning as many horizontally tiled screens as necessary. Launchpad stays in sync with applications you add or remove, either manually or via the Mac App Store, and functions just as you're used to if you've ever used as iOS device. One sticking point is that apps can't be selected by typing their name on the keyboard – a pointing device is compulsory, which feels a little mean. Otherwise, the interface works very well, and its privileged position in the Dock will surely help beginners find applications without knowing about Spotlight or the Applications folder. It's unlikely to get much use from more advanced users, but it's by no means forced upon you. Many applications, including several from Apple, have had full-screen modes for years now, but each was different in its appearance and behaviour. With Lion, Apple introduces not only a standards means for apps to support a full-screen mode, but also native integration with Spaces (its multi-workspace implementation) for those that do. Apps supporting the new Full-Screen API gain a subtle icon on the extreme right of their title bars (the by now standard diagonally-opposed arrows). Clicking the icon causes the app to enter Full-Screen mode, which promotes it to occupy a new Space of its own. Each app in Full-Screen mode occupies a unique Space, and these Spaces are implicitly tiled horizontally (accessible via four-finger horizontal swipe gestures). The menu bar disappears in Full-Screen mode, though it rolls down into view if the pointer is hovered near the top of the screen – which gains a new button at its right side so you can exit Full-Screen mode and return to the normal Space for that application. 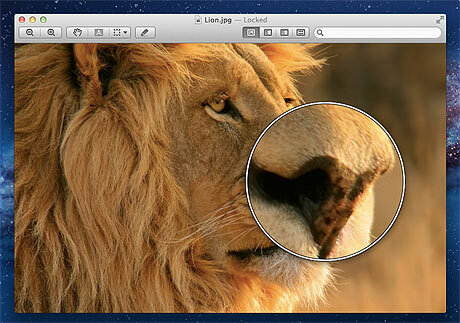 It's an interesting approach, and in practice turns out to be one of Lion's most compelling features. It makes the most of smaller screens such the MacBook Air's, and being able to swipe between each such app makes it very straightforward to get to the Desktop or to another app temporarily, without feeling that you're constantly shuffling windows or having to hide other apps. Developers whose apps could even remotely plausibly benefit from a Full-Screen mode would be well advised to adopt this new API as soon as possible. 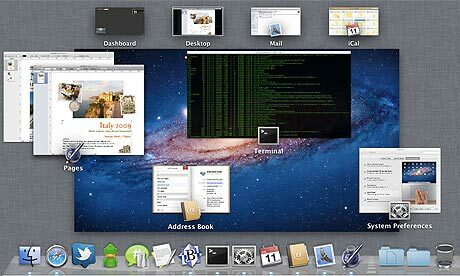 For several versions, OS X has had a somewhat confusing conglomeration of app, window and widget-managing environments and utilities: Spaces for virtual desktops, Exposé for window management, and the Dashboard for "widgets" – small, utility applications mainly for status displays and suchlike. Each one has their proponents, but integration between them was loose at best. 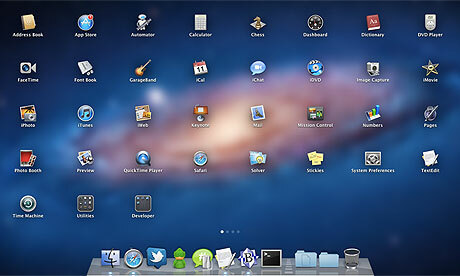 Lion attempts to gather the majority of their functionality, and that of Full-Screen Apps, under a unified interface called Mission Control. Essentially, it's where you can see everything that's happening across all the windows and Spaces. There's no kind way to say this: initially, Mission Control is confusing. There are a lot of things going on, and its aims are lofty indeed. The good news is, it does work, and with some perseverance you come to realise that it provides a sensible subset of app, window and Space management in a relatively concise (if not especially inviting, at first) interface. Mission Control is split conceptually into two sections: Spaces along the top (including those you've created yourself, Full-Screen apps, and optionally the Dashboard too), and apps on the current Space in the middle (with their windows grouped together). You can move between Spaces using the same horizontal four-fingered gesture whilst in Mission Control, and the focus will change to the relevant Space. You can switch apps, Spaces and even choose specific windows from here, which will bring the relevant app to the front as normal. It's Space management, however, where Mission Control gets clever. (Did the Apple engineers love the implied joke of "Spaces" and "Mission Control"?) You can create new Spaces manually by hovering over the top-right (as a nice touch, if you have random desktop pictures enabled, each new Space gets a new picture), and you can delete any Spaces you've created by hovering over it in the top row to get an delete icon. The row of Spaces resizes to fit, as icons in the Dock do. App windows and even entire apps can be dragged between Spaces from within Mission Control. (For apps, drag the icon of the app which is shown centred below its collected windows.) Quick Look works for the window you're pointing at, temporarily zooming it to full size, and windows continue to update live at all times. Once you've grasped the idea that all Spaces (which might have your running Full-Screen apps) are listed along the top, and the main central display is that of the current Space, Mission Control becomes extremely useful. It's trivial to shuffle windows or entire apps between Spaces, or create new ones on the fly for a given task. The disparate functionality of Spaces and Exposé have been convincingly integrated here. It may intimidate at first, but it repays time spent becoming familiar with it. 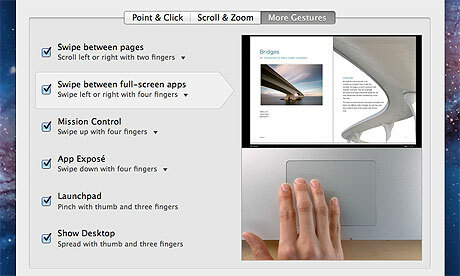 Like it or not, multi-touch gestures are the lingua franca of Lion. If you've somehow been holding out on moving to a Magic Mouse or Magic Trackpad full time, you may want to reconsider your position. Swipes, pinches and flicks are supported far more widely than before, including for history navigation in Safari, triggering Launchpad and Mission Control, and much more. What were previously somewhat gimmicky conveniences have now become first-class interaction techniques, and there's every indication Apple will expand gesture support in future. The new System Preferences panes for your preferred multi-touch input devices have many additional gesture options, complete with the expected slick demonstration videos. You're relatively free to pick the type of gestures you prefer (three- or four-finger swiping particularly), but the message is clear: while you don't absolutely have to use them, your life on Lion will be much easier if you do. 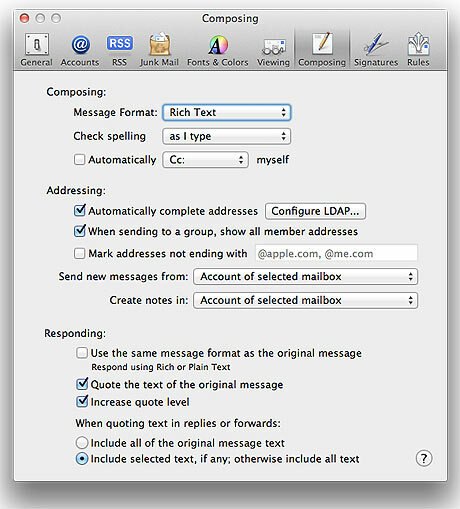 One of the most dramatic app-revamps in Lion is that of Mail, the venerable email client which has been kicking around in one form or another since NeXT Computer's NeXTSTEP in the mid-80s. Gone (by default, but once again restorable via a preference, if you wish) is the traditional layout with the message list along the top and message preview below; in Lion, Mail has a three-column view which immediately brings to mind its iPad cousin. Another borrowing from iOS is the preview of the first few lines of a message in the list itself, and a minimalist display (with on-hover action buttons) when viewing the full content. It's visually much cleaner, and has a number of improvements (such as – at last! – multiple colours for "flags" on messages, and a threaded and quote-stripped conversation view like Gmail). 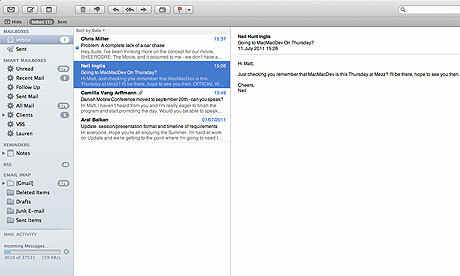 This version of Mail feels lighter and more like a new application than an upgraded version. Naturally, it supports Full-Screen mode, and even the mailboxes list can be collapsed for a truly iPad-like experience. Also new are Exchange 2010 support (shared with Address Book and iCal), Search Tokens (as in the Finder search), and a number of tweaks to toolbars and formatting controls. If Mail is your email client of choice, there's only good news here. While Mail has gone sleek and efficient, the other two main productivity apps included with OS X have instead leaned in the direction of whimsy. 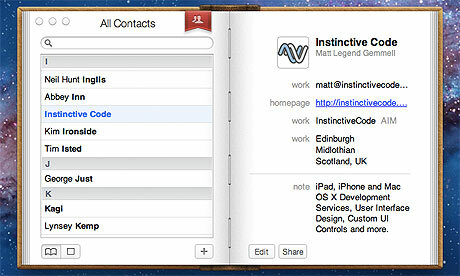 Address Book is now, well, an address book – almost identical to its iPad incarnation. The wisdom of this decision is questionable, though there's no doubt it's attractive to look at (if oddly small, sitting on a vast iMac screen). Address Book has always had a gimmicky, somewhat awkward and frictional interface, and this new version doesn't improve matters. It has a few useful new features – more comprehensive integrated IM buddy status – but its new appearance will have more detractors than supporters. It's continues to be a capable and functional oddity whose eccentricities now include its aesthetics. iCal also adopts its iPad version's look, complete with oh-so-irritating pieces of torn paper along the top, but makes up for it with a useful new Year view, and a revamped Day view to match the iPad version, with a summary and full day planner side by side. Full-Screen mode is also present and correct, making for a welcome if not terribly exciting upgrade. Mac OS X's web browser has a modest list of user-visible additions, and a long list of improvements behind the scenes. Full-Screen mode makes a much-appreciated appearance, as does iOS-like tap-to-zoom (automatically finding the nearest boundaries of an image, or a column or text, as you'd desire). Swipe gestures move you back and forward through your history, accompanied by an initially jarring but eventually pleasing animation. 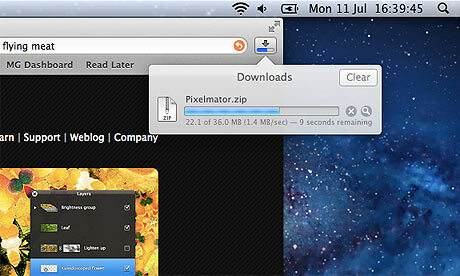 The Downloads window is no more, replaced by an unobtrusive popup available from the extreme right of the main toolbar, showing a handy progress indicator. Among the things you won't notice, but are there: performance, privacy, stability, compatibility and security improvements, improved HTML5 support, the ability to view (or remove) all data a site has stored on your computer, sandboxing of sites, and improved CSS3 support. Last, but certainly not least, Safari in Lion now competes with Instapaper and other "read it later" services with its new Reading List; a way to bookmark articles or pages you want to read at a later time. It's synced to your iOS devices too, naturally, via the to-be-released iCloud. It's not much more than an extra (and temporary) location for bookmarks, but coupled with Safari's existing (and confusingly similarly-named) Reader feature, you can have a comfortable reading experience for lengthy articles without cluttering up your main bookmarks or using an external service. There's a brand new pane – though it will be familiar to iOS users – called Mail, Contacts and Calendars, giving a central location to set up email, CardDAV, CalDAV, LDAP, and instant messaging accounts, for Apple's applications and any others that wish to use them. 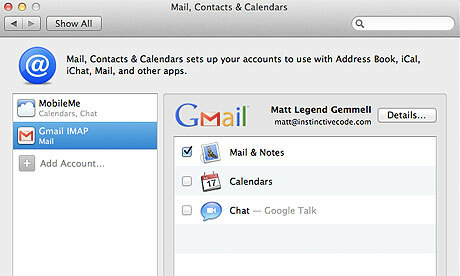 There's quick setup for Exchange, MobileMe (soon to be the free iCloud), Gmail, Yahoo, AOL, and Mac OS X Server accounts. Previously, setting up accounts was done inside the relevant Apple applications (even if you preferred to use a third-party app instead), so the consolidation is logical and much appreciated. Score another one for iOS's approach as the better way – and one to Apple for getting rid of the way it had done it for years in favour of a better one. 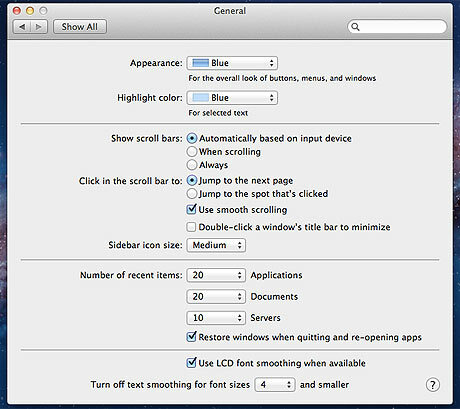 Most of us probably haven't looked at the "General" preference pane in years, but you may want to revisit it now – it has a new setting which controls how scrollbars behave in Lion. By default, Lion has iOS-like scrollbars – thin, plain, translucent scroll-thumbs which appear only momentarily during scrolling. 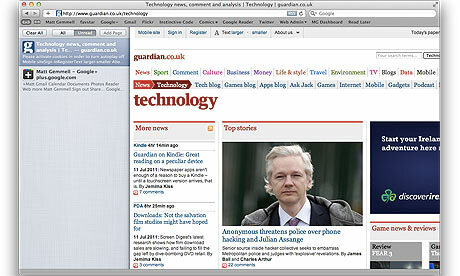 Some older apps will continue to always use full Aqua scrollbars, but Lion itself almost exclusively uses the new style. If you prefer always-visible scrollbars, this is where you can set it up. 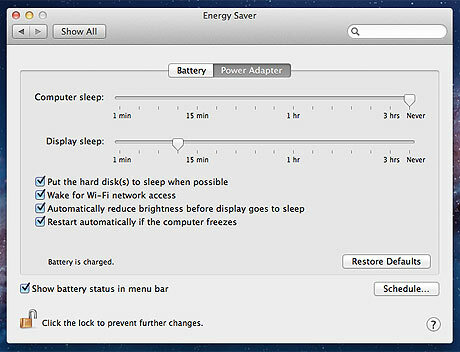 A small but handy new option has been added to the Energy Saver settings too: automatically restart the computer if it freezes. Potentially useful for machines running server processes or for remote file sharing. Automatic restart on freeze ... though when's the last time your Mac froze? 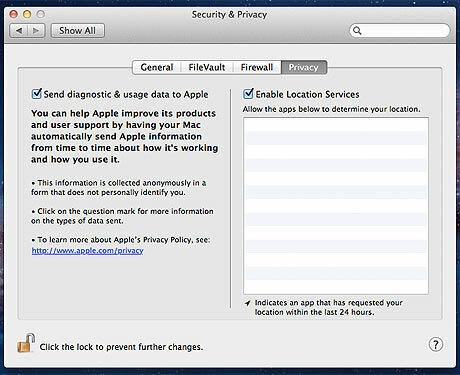 Lion now has an extra tab in the Security (now aptly called Security & Privacy) pane, showing a list of all apps which have recently requested your location (as iOS does), and the option to opt out of sending diagnostic and usage data for your Mac to Apple. 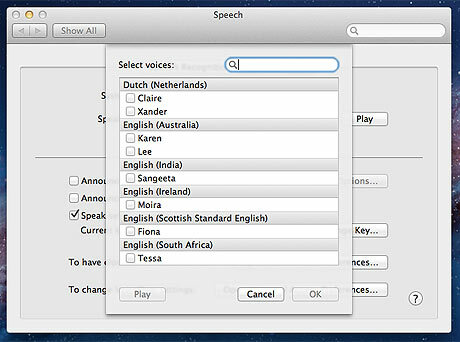 Finally, at long last, English-speaking text-to-speech users need no longer suffer under the at times gratingly soulless voice of Alex, the default speaking voice in Snow Leopard. Lion includes the ability to choose (automatically downloading as necessary) a host of new voices in a multitude of languages, including several British English voices, complete with Scottish and Irish variants. Lion has three new features which are related to one another, and all equally welcome. Resume does exactly what it says: when you log back in, or even restart your machine, your session will resume exactly as it was before – right down to the apps and windows that were open, as if you'd never left. We've become somewhat used to this on iOS, but it really is a novelty on a desktop OS. Even current selections are preserved within documents. Extremely useful, and a feature quickly missed if you use another operating system or even an older version of OS X. Just be sure there was nothing compromising on your screen last time (but yes, you can choose not to resume if you wish). Auto Save is similarly self-explanatory: for apps which have opted into the behaviour, documents will be automatically saved at set intervals. 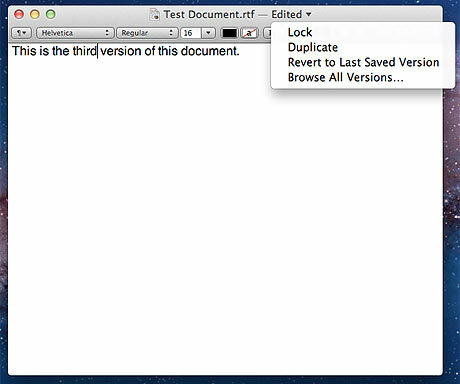 Such documents gain a new control in their title bar when the pointer hovers over there: an arrow which spawns a menu. You can quickly revert to the last explicitly-saved version of a document (a necessary option, given the nature of auto-saving) and can even lock a document such that no further auto-saves will occur. Time Machine in Lion also gives you the option of automatically locking documents of a certain vintage, to prevent accidental edits if you happen to open them later. If you wish to lock the current version of a document but make further independent edits, you can duplicate the document here too. 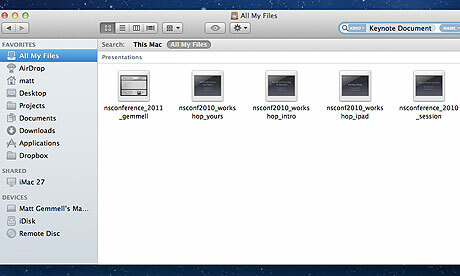 The real fun, however, comes when you choose the last command in the menu, and browse all saved versions of the file. This is Versions. 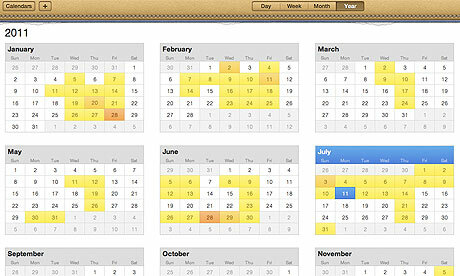 If you've used Time Machine, the Versions browser will be immediately familiar. It uses the same visual metaphor of versions drifting back into cosmic history, and any version can be restored with a click. The really clever part, though, is that all of the older versions aren't just static renderings – they're live documents. You can click into them, copy some content, and then paste it into the latest version. Incredibly useful for grabbing some bits of a previous version without clobbering all your other recent changes. Resume is a feature that everyone will immediately understand and enjoy, whereas Auto Save's more complex functionality (and Versions as a whole) are somewhat hidden, and perhaps more suited to advanced users - but for those users, they're indispensable. Auto Save andVersions, particularly, finally fulfil the other half of Time Machine's promise, and are very welcome indeed. 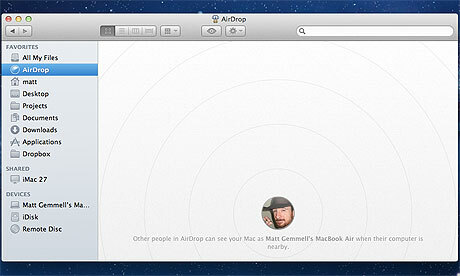 Lion boasts a new zero-configuration file sharing feature called AirDrop, complete with parachuting parcel icon. 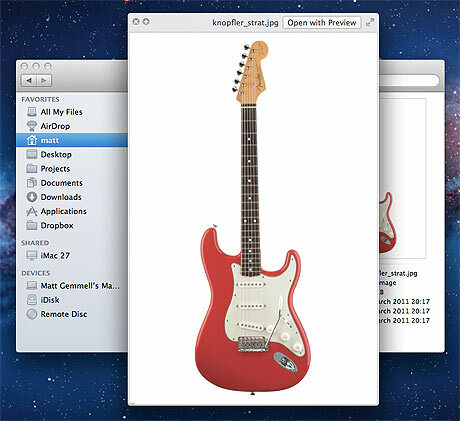 It lives in the Finder's sidebar, and when active, other Lion users can simply drop files onto your user account photo to share them with you. File sharing has always required some fiddling around (enabling sharing in System Preferences, then finding the relevant machine in the Sidebar, then navigating to the shared folder), and AirDrop takes all the effort away. No doubt very useful for lab or school situations, or even just for a multiple-machine setup. Security implications? There aren't really any. It's write-only (you only see another person's user account photo as a drop-target; you're not browsing a list of their files). You're asked to confirm any file you drop onto a person's photo in the AirDrop section of a Finder window, and then the recipient is asked to confirm that they want to receive the file. If they accept, it's placed into their own Downloads folder. The sender sees nothing at all on the recipient's machine, nor vice versa. And yes, the files are encrypted as they're sent. AirDrop requires that both parties be on the same Wi-Fi network, and only works when both parties have a Finder window open and are viewing the AirDrop section; if you aren't viewing the AirDrop area, you're not visible to others via AirDrop at all. Quick Look has had a few enhancements, including (at long, long last) the ability to automatically resize its preview window as you switch between multiple files. The preview window itself is now grey in appearance, and includes an "Open with Preview" button that causes the window to smoothly transition into an open Preview document, which is a nice touch. 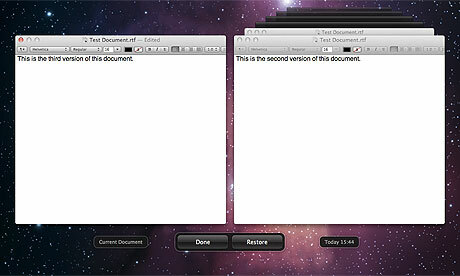 Preview itself sensibly supports Full-Screen mode, and includes a loupe to magnify areas of any document. Intelligently, it provides a circular loupe for images, and a large rectangular magnifier for areas of text. Windows across the OS can now be resized from any corner or edge, losing their lower-right resize indicator, and have rounded corners as panels do on iOS. All the standard widgets have had a polish up, and have an overall more silver-grey and rounded-rectangle appearance. The ubiquitous blue highlight has been brightened, in Apple's seemingly endless search of the ideal shade. Note that standard widgets now look rather soft compared to those on Snow Leopard, and in some cases it can be difficult to tell whether a control is enabled or not. The visual contrast of some controls just isn't as high as it was before. They'll no doubt change again next time. 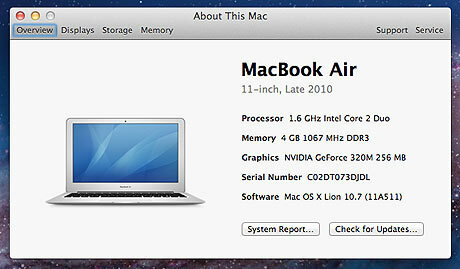 System Profiler is now called System Information, and when accessed from the "About This Mac" panel in the Apple menu, has a new streamlined appearance giving a useful summary of relevant hardware and software info. You can still access the old verbose display too, as you'd expect. Lion is the first version of OS X to be distributed exclusively online, and indeed exclusively via the Mac App Store. What this means in practice is that you need to have the Mac App Store app (available free from Apple) installed on your Mac before you can upgrade to Lion, and what thatmeans is that you need the latest version of Snow Leopard. Other requirements are at least 2GB of RAM, and either an Intel Core 2 Duo, Core i3, Core i5 or Xeon processor (or better). Generally, Macs from late 2006 onwards (excluding Mac mini models which don't meet the aforementioned spec) should be ready to go. Lion will cost £20.99, and when installed creates a small restore partition on your boot drive, from which you can repair or reinstall OS X if things ever go wrong, without needing any optical media or external drives. If you're running any code from the PowerPC days, this is the time to wave it goodbye. The Rosetta software that came with Leopard, and was an optional install with Snow Leopard, won't be installed or supported. Lion is the end of the road for PowerPC apps. Attempting to run one results in a dialog saying: "You can't open the application [Whatever] because PowerPC applications are no longer supported." There is no offer nor option to do anything about it. It's been five years since Apple changed to Intel, and PowerPC has run out of road. The same is true of "incompatible" software: during installation of the OS, Lion will move any apps known to be incompatible apps into a new "Incompatible Software" folder at the top level (root) of the boot drive, including a "Read Me" file telling you what was moved. Lion also informs you that it has done so. This doesn't seem to be limited to just PowerPC apps; Apple maintains a list of known-incompatible versions of specific apps, and Lion checks for them. You may have noticed that there isn't an installation disk for Lion: it's just installed directly onto your machine from download. This obviously leads to the question of what happens if you have a disk crash and have to rebuild your disk directory using Disk Utility or a third-party utility: how do you reboot to rebuild the disk if the disk you're trying to reboot from is the one that's broken? I recall that Steve Jobs has said that you can boot from Snow Leopard though, in one of his recent replies to a customer's email. Perhaps when booting from the restore partition, you'll be offered the choice to create a bootable external volume/disc of Lion? We don't know the answer yet. But that is why it's really important to remember the mantra: back up before you install. And make sure that you can boot from the backup. It's only a few extra minutes, and it's worth the effort. Lion has a vast array of new features (here's the full list) and perhaps unlike Snow Leopard, the majority of them will be useful to the average user right from the start. Despite initial concerns about an "iOS-ifying" of OS X meaning a reduction in functionality or flexibility, the opposite is actually true – the new version of OS X fulfils the promise of "Back to the Mac" without compromising the focussed elegance of the user experience we've come to rely on. While it's true that there are a few rough edges (mostly related to changed-for-the-sake-of-it cosmetic tweaks, and a lack of obviousness of some of the new functionality like Auto Save), overall Lion is an exceptionally solid and exciting release. There are many new features to be enjoyed by those with any level of experience with OS X, and existing apps and features have been polished and thoughtfully refined. Lion is a substantial improvement across the board, and at only £21, it's a steal. 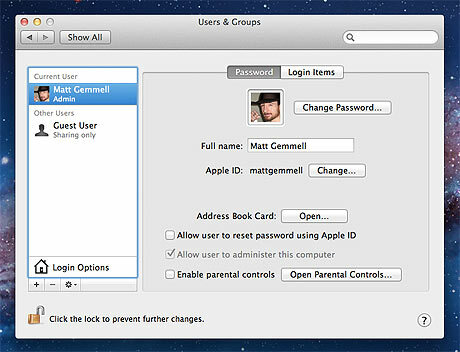 • Matt Gemmell is an iPad, iPhone and Mac OS X developer specialising in user experience. He runs his own business, Instinctive Code, and is an invited speaker at industry conferences. He has written hundreds of articles on development and interface design at mattgemmell.com, and his clients include Apple and other Fortune 500 companies.